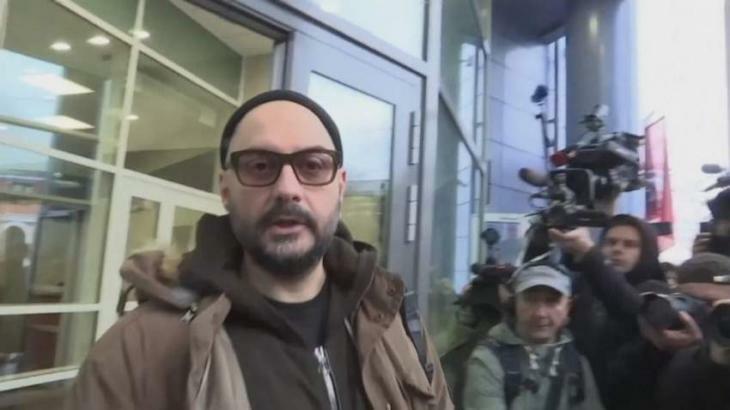 Moscow, (UrduPoint / Pakistan Point News - 17th Apr, 2019 ) :Russian director Kirill Serebrennikov has won the country's top theater award a week after he was released from a more than year-long house arrest pending his trial on embezzlement charges. The 49-year-old, who was forced to miss the Cannes Premiere of his acclaimed film "Summer" last year, has long denounced the case against him as "absurd". He continued working remotely since his detention in August 2017 and late Tuesday he was announced as winner of the Golden Mask prizes for best drama director and best ballet. "I hope you gave me this award because you really liked the play," Serebrennikov said in his acceptance speech, to some laughter from the audience. "I hope the theatre community will also give each other support, like it supports me," he said, according to footage broadcast by independent channel tv Rain. The play, "Little Tragedies," a modern take on classic works by Alexander Pushkin, premiered in the theatre Serebrennikov heads, Gogol Center, after his arrest in August 2017. Work on it had to be finished without him. In a surprise decision last Monday, a Moscow court ordered his release from house arrest but said he must remain in the capital as the hearing of his case continues. The director and three of his co-defendants are accused of creating an organised criminal group and embezzling more than $2 million (1.75 million Euros) of state funding for a theatre project called Platforma. He has insisted the money was used legitimately. This week the court ordered a second assessment of the project's finances and artistic merit for the case, reports said. Serebrennikov also collected the ballet prize for the Bolshoi's controversial "Nureyev". The ballet, based on the life of Russian dance legend Rudolf Nureyev, was pulled just days before its original premiere set for May 2017, but was performed later that year. Bolshoi management cited an under-rehearsed cast for the delay but speculation swirled that it had been pulled because of the investigation into the director, or the ballet's treatment of Nureyev's homosexuality. Serebrennikov's detention sent shockwaves through the Russian arts world and his case became a cause celebre in the West. Salman Khan finally introduces his beautiful 'Madam Sir' and 'Bharat Ka Junoon' Katrina Kaif in the ..